Here are three fundraising initiatives taking place in Brussels this spring, where you will have the opportunity to contribute to the work of deserving organisations, to enable them to carry on offering the help we need. Mental health is also the theme of the Darkness into Light walk on Saturday 11 May at Parc du Cinquantenaire. This is the second year the walk has been organised in Brussels. Throughout the world at 5.00 in the morning, thousands of people will walk through the darkness of the night towards the dawning light of day. The money raised from the registration fee and sponsorship of the Brussels walk will benefit three suicide and self-harm prevention charities – Pieta House in Ireland, the Centrum ter Preventie van Zelfdoding and the Centre de Prevention de Siuicide in Belgium. The aim of Darkness into Light is to allow everyone to play a part in removing the stigma around suicide and self-harm. For the past 30 years, Relay for Life events have been held around the globe to raise money for the fight against cancer, specifically to support cancer research, to prevent cancer by screening and promoting a healthy lifestyle, and to provide social care to people affected by cancer. 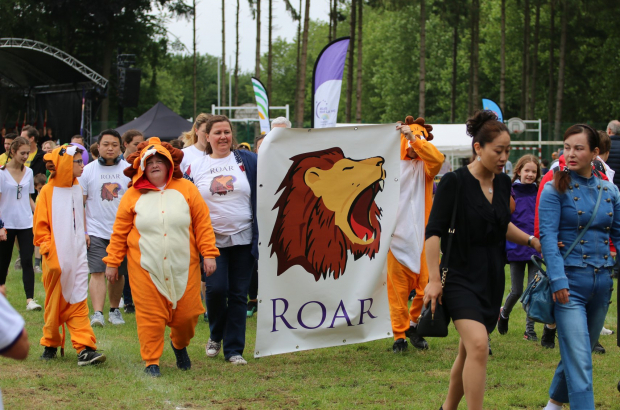 Relay for Life International Community has been taking place for the several years - and last year they successfully raised €72,163. All funds from the event are donated to the Belgian Foundation against Cancer. During a relay, team members of all ages take it in turns to run or walk around a track for 24 hours. During those 24 hours participants and visitors are treated to live entertainment, games, fun and wellness activities, and food and drink are available from stalls dotted around the track. There is a special walk for those who have beaten cancer, are currently struggling with cancer and their caregivers and they are the celebrities of the event. A luminaria ceremony to remember family and friends that have passed away from cancer is also a regular poignant feature of the evening. Roberto Martinez, coach of the Belgian Red Devils, will be the patron of this year’s event and will be present for the opening ceremony on Saturday 4 May at 14.00.